Jump & Jack’s indoor party, play and family entertainment center is located in West Chester, Ohio. Jump & Jack’s mission is to provide and promote active and engaging play for children within the age range of 2 to 11. Jump & Jack’s consists of three attraction areas and three private party rooms. Jack’s Playground, the feature attraction, includes the largest multi-level play structure in Ohio as well as BEAM, a interactive projection game system. BEAM entices kids to run, twist, dance and jump using their hands and feet to play colorful fun games and activate colorful graphics projected on the floor. Kids can pop balloons, play the piano, and even show off their soccer skills. Jump & Jack’s is an indoor party and play center located in West Chester, Ohio. Jump & Jack’s is designed for the active play of children, from crawlers up to around 11 years old. Main attractions include Jack’s Playground, which offers four levels of play with slides, interactive activities, etc. 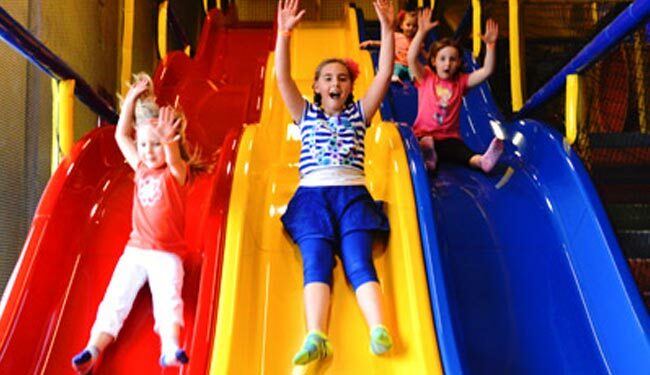 Jump & Jack’s is 12,000 square feet of fun!